How do you go about creating the best, most responsive solid-state drive on the market today? Though NAND-based drives can claim super-impressive sequential speeds, responsiveness, which is key to excellent performance in the workstation and high-end desktop market, requires technology that has fundamentally lower latency. 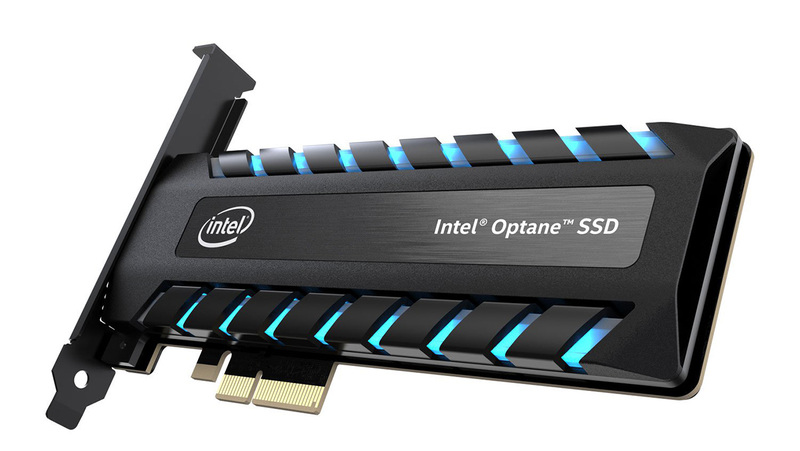 Enter Intel's Optane, powered by 3D XPoint memory. The first question that needs answering is how 3D XPoint technology is better than ubiquitous NAND with respect to latency and, therefore, responsiveness and small-file performance. The answer rests with the way in which memory is accessed. With normal NAND, common in the vast majority of SSDs, data is stored in cells but is accessed in a collection of rows that are known as a page. These pages are usually between 2KB and 16KB in size, and a number of pages make up what is known as a block. The NAND limitation is that it must read and write to pages, not cells or individual bits. In fact, the situation is less granular than this in practice. NAND-based SSDs typically erase and write data at block level - usually with 256 pages per block - because it is more power-efficient than going page by page. What this all means is that while MLC NAND-based SSDs are miles faster than mechanical HDDs due to a lack of moving parts, the typical read and write latency is around 50 microseconds and 1,000 microseconds, respectively. Compare this with 0.1 microseconds for good, old main computer memory. Wouldn't it be great to get closer to the alacrity of RAM while having the capacity of NAND? 3D XPoint has been constructed to fill this gap. 3D XPoint, the bedrock of Intel's Optane technology, achieves this by enabling its controller to access memory at the bit level - with one bit per cell - and the addition of a low-delay interconnect and fast switching material ramps up responsiveness. Greater responsiveness, the ability to read and write at bit level, and having only a single bit per cell combine to give 3D XPoint a number of advantages over the best NAND-based SSDs. Most of the goodness is a solid fit for the workstation or server; one can expect higher random read and write performance, better performance at low queue depths, massive endurance, better numbers when the drive is near full, and punchy results with smaller-capacity drives. All good, huh. As an example, Intel's latest Optane drive is the 905P. Available in 480GB and 960GB capacities, it offers read and write latencies of less than 10 microseconds, which is way faster than any NAND-based SSD. The resulting responsiveness enables it to punch out over 500,000 IOPS for random reads and writes, hitting speeds that traditional SSDs find difficult to emulate. This is the key reason why Intel sees Optane a perfect fit for either high-end desktop or workstation. Sure, a quality NAND SSD will do a good job, but its performance ought to be eclipsed by Optane. The nature of Optane's technology means that Intel can keep the same high-speed specifications for both the 480GB and 960GB models. In fact, there are only two key differences between the pair. The first is form factor, as the 480GB version is only available in a U2 form factor. Bummer, you may think, because your motherboard may not support it. As the drive rides off the PCIe interface, Intel also offers the same solution with a hardwired M.2 connector, which we'll show further down this page. If that simply doesn't cut it for you, the SSD 905P has also been made available in a standard M.2 form factor, albeit limited to 380GB in capacity. Cranking up the capacity to 960GB changes the form factor to half-height, half-length PCIe add-in card, complete with blue LED bling. What both capacities share is excellent endurance, rated at 10 full drive writes per day over the five-year warranty period. We're talking approximately 5TB or 10TB a day every day for five years. Endurance, then, is a non-issue for 99 per cent of prospective customers. Though sequential speed is nothing to write home about (it's the wrong metric for this drive), having uber responsiveness and sky-high IOPS leads to pricing that's (un)comfortably higher than traditional SSDs. 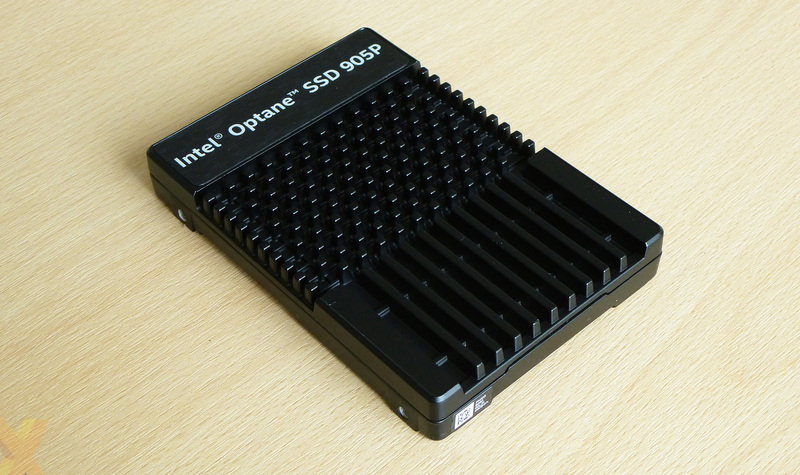 At a cost of over £1 per GB, the Intel Optane SSD 905P Series is well over 2x the price of, say, the well-reviewed, speedy WD Black NVMe SSD based on MLC NAND. Whether the premium is justifiable depends entirely on how important absolute IOPS performance is to your workload(s). Here's the 480GB model presented in a U.2 form factor. Intel takes cooling seriously on the drive that measures 101mm x 70mm x 15mm. The aluminium casing acts as a giant heatsink. Is it needed? Intel reckons the drive pulls 3.3W at idle, 7.6W average power when reading and 12.4W when writing. Not huge figures, but it does make sense to keep the 3D XPoint memory cool enough so that it operates at full speed all the time. Construction is excellent, with the 140g weight making it feel more like a 2.5in mechanical spinner. But boy does it get warm to the touch after extended use. That said, there was no evidence of performance throttling at any point. Surface area is increased by having pimpled sections on both the front and back. 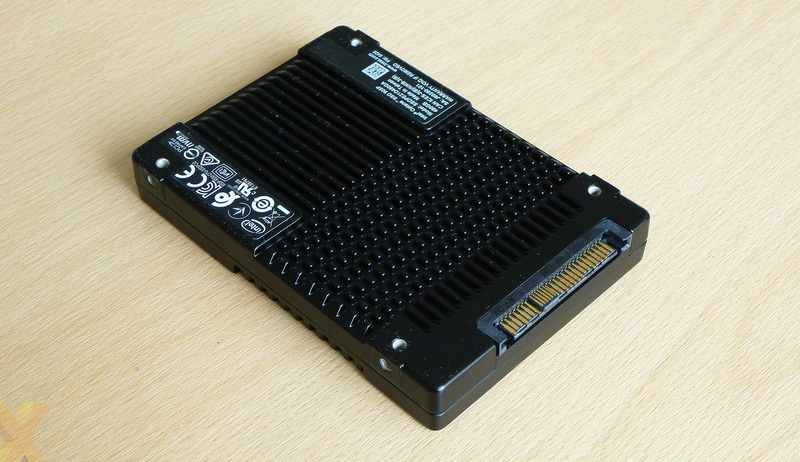 The U.2 name, previously known as SFF-8639, is for the connector, not the form factor of the drive. Intel, actually, has another version of this drive that includes a U.2-to-miniSAS HD connector. 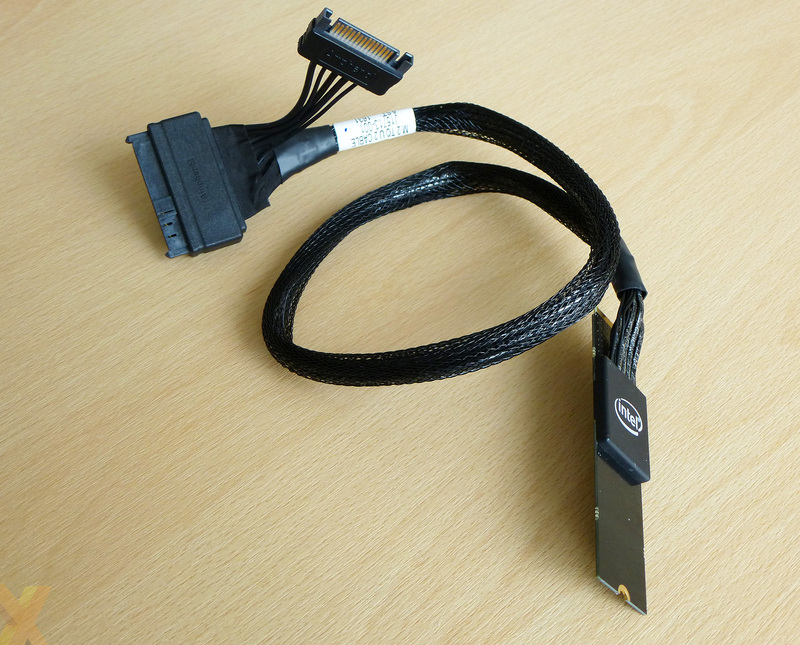 Our review model, provided by Intel UK, came with the aforementioned U.2-to-M.2 cable. Power is sourced via a regular SATA connector hardwired to the U.2 data port.